Though featuring a down-beat ending, this true tale of a Czech journalist who gives her life helping the oppressed during the years prior to WWII is an inspirational one. Milen Jesnska began her quest to help others in 1920 Prague when she defied her father's wishes that she become a doctor like him and went into journalism. For a while she lives in Vienna with her husband, Jewish music critic Ernst Pollack, and during that time begins writing regularly to Franz Kafka. After leaving her husband and returning to Prague to be with her father, she and Kafka meet, and she becomes his friend and translator. In 1923, she covers an important workers' strike and meets and marries Jaromir, a communist architect. 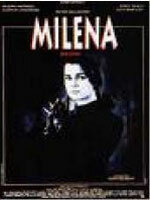 Becoming a communist herself, Milena writes articles for a Marxist newspaper. As Nazis come to power in Germany, they become her next cause. She boldly speaks out against them and because of this is sent to a concentration camp during the war.